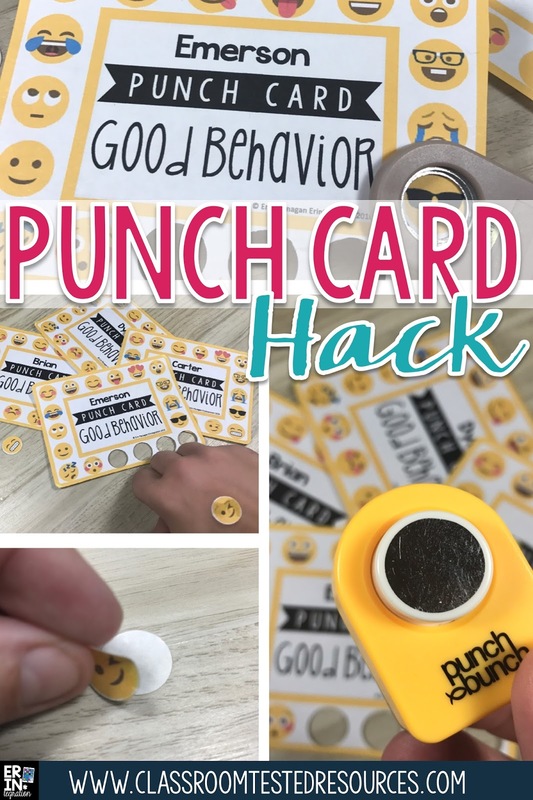 Learn how to upgrade a standard behavior or incentive punch card with this simple hack to make a sticker punch card for instant positive reinforcement and long-term goal setting in one. A punch card is a piece of cardstock usually with a student name and a certain amount of “slots” that are punched by the teacher. The slots can be punched when the teacher observes positive student behaviors – this is usually discussed ahead with the student as part of a classroom management plan or an individual behavior plan. You can also use punch cards to “save up” for something – for example a student receives a punch with every library book returned. Slots are typically punched with a traditional hole puncher. Once the card is filled, the student earns either a prize or a non-tangible reward. There are many articles written about classroom rewards, incentives, punch cards, and the pros and cons of incentive-based classroom management systems. Rather than debate the merits, I would advise teachers to read up on ways to use punch cards in the classroom and make their own informed decision. You know your students best and combined with best practices there are many ways to use punch cards that are worthwhile in the classroom. My one recommendation is to only punch for something positive, be mindful of the reward – is it achievable, is it extrinsic or intrinsic, is it meaningful – and to make objective and measurable goals. If you do use it for behavior, try to break the behavior into a specific positive one - rather than "good behavior" choose something concrete like "Raises hand at circle time" or "Pushes chair in." For these type of goals, be sure to explain that students may not receive a punch EVERY time so the more they try, the more likely you will see it and punch it. Also be sure to limit competition and comparison. One way to do this is to have different goals for each student. Students can even create their own goal to track. When students are involved in the process, they are more motivated to reach their goals too. My editable Emoji punch cards show in this article allow you to type in student names and goals / rewards so creating a different punch card for each student is easy. 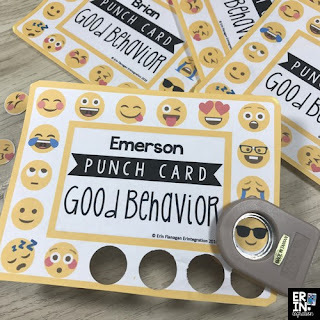 I also find that differentiating punch cards and rewards reduces stress and students will earn punches at different times. 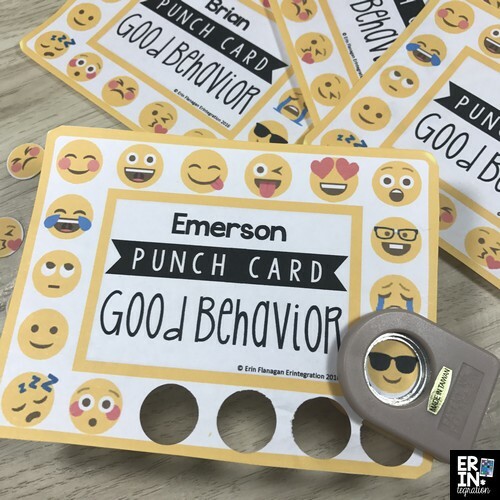 While punch cards do offer a visual recognition of achievement, some students struggle with long term rewards and might need feedback right away to continue to behavior. In the beginning the punch itself provides that boost, but after a while some students may need more immediate recognition. For example, a student struggles with returning his take-home folder. He creates a goal to track on his punch card so that each time he returns the folder, he get a punch. After the card is full, he gets a special privilege…maybe he gets his pictures taken (holding the folder of course!) and his photo and card added to a Super Improver Wall or emailed home with a positive message. However, for this particular student, filling the punch card is difficult and lengthy compared with his peers. He feels frustrated and loses motivation. Also, punch cards are limited in that the “progress” is only shown on the card itself. This makes extra steps needed if you want to share these with parents. Sending them back and forth opens up the chance that it will get lost. Solve the issues mentioned above by turning an ordinary punch card into a sticker punch card! All you need to do is print punch cards onto full sheet sticker paper (or 4x4 large label paper). Keep the back of the sticker paper on. Depending on the “slots” of your punch card, you can use a circle puncher to punch out a space. 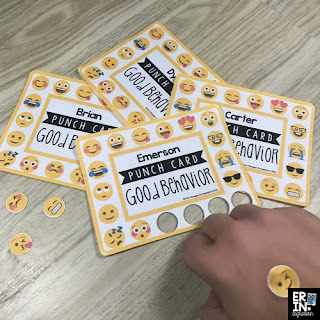 For my Emoji Punch Cards, each Emoji is roughly 16 mm or 5/8 inch so a circle puncher that punches that size works best. 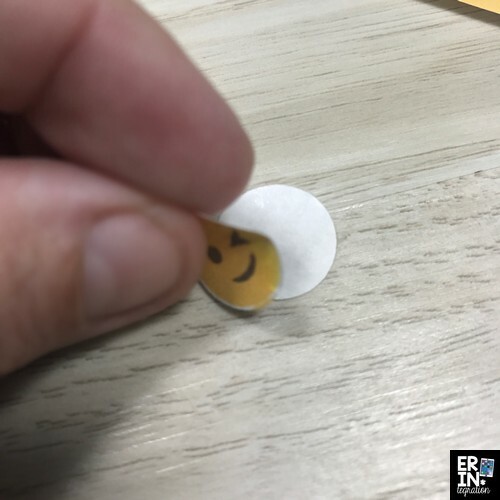 After punching the Emoji out, remove the backing paper and voila, the Emoji is now a sticker! The punch card still shows how many “slots” are used for long-term tracking, but now students receive an instant reward! You can have students keep stickers inside a take home folder or wear them home to share with families. Students also like decorating their school supply bins and notebooks too. For punches, Amazon has a small selection including the Punch Bunch one I use but there are other options at Michaels and Hobby Lobby too. 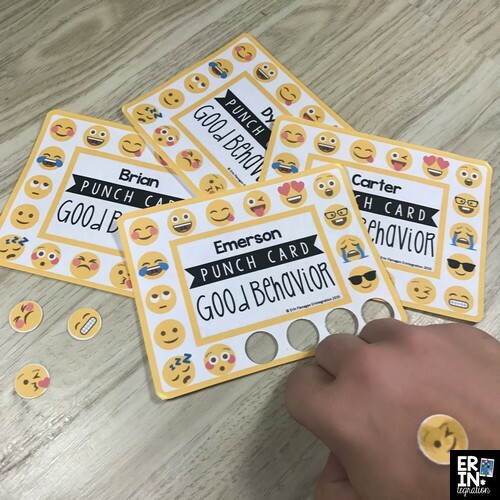 Just be sure to use a punch that allows you to view the shape being punched so you can correctly line up the Emoji or other image on the punch card. I have to flip mine upside down to view and then press, which isn't ideal but I'm used to it. If your punch cards have irregular slots or you want to save money, simply cut the sticker out in a square shape or use a larger sized circle punch. 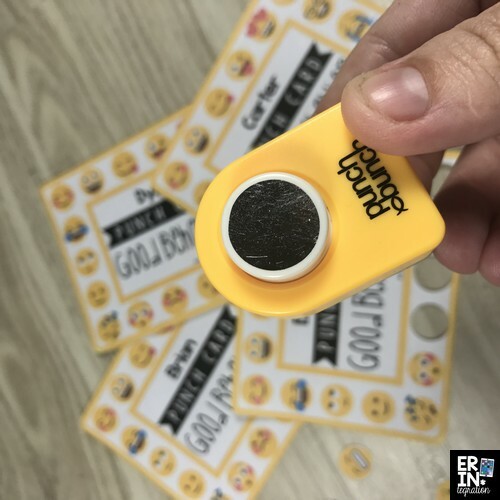 Get my Editable Emoji Punch Cards here and check out Erintegration's other ideas and activities for using Emojis in the classroom. Have you ever used punch cards or other positive reinforcement classroom management techniques before? Share in the comments! Love using punchcards. So easy for quick classroom management and incentives! I love this idea. Thanks for sharing! Wow! I love this idea! I have some tricky students on behavior contracts this year, but this would be more my style putting the positive spin on it! Thanks for sharing!